“All You Need to Know”:Enhancing Engagement,Communication and Knowledge Management for a trade and services association. Credit Union Central of Manitoba (CUCM) is the trade association for Manitoba’s credit unions, providing services in areas of capital and financial management, banking services, product and service research and development, consulting, and advocacy. Promoting co-operative principles to facilitate co-operative action. CUCM refined its strategic direction and the new approach depended heavily on engagement, communication and knowledge management. Associations like CUCM don’t follow a typical enterprise model. Their member credit unions are not on the same shared platform. They have many information needs and require complex solutions to business problems, so CUCM needed to develop a network architecture between their thirty-one member credit unions to communicate and share work easily, securely and remotely. CUCM used an extranet to collaborate with its members, the credit unions of Manitoba. The previous private extranet site was used by about 300 individuals, mostly senior management, and CUCM relied on them to cascade information further. CUCM’s previous extranet was mainly a one-way portal, accessible from credit union offices, and had a relatively static interface that was difficult to maintain. The functionality it offered member credit unions didn’t meet CUCM’s strategic goals. CUCM also had a SharePoint intranet with very basic functionality before engaging with Imaginet. Unfortunately, they had not had access to strategic support to develop the previous intranet, so it was not being leveraged as effectively as it could have been. After investigating other technologies, CUCM decided to use newer-generation SharePoint tools and functionality to enhance and extend its engagement, collaboration and knowledge management options. To achieve its goals, CUCM identified the need for expert support. From an architectural perspective, they faced a very complex implementation and required support in the areas of site governance (how to design site structure, ownership and permissions) and user-experience design. 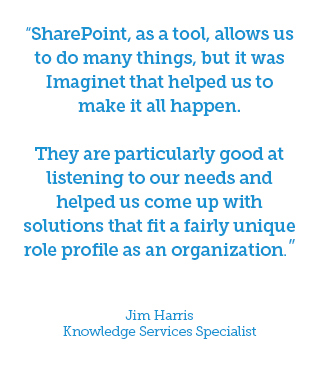 They needed a credible technology partner with both proven and deep expertise in complex SharePoint implementations. Imaginet brought CUCM the most robust intranet roadmap and plan in the market and developed a deep understanding of their complete architecture, helping them work with their vendors to provide the best solutions. This transition was complex, yet Imaginet brought an effective process that allowed credit union employees and board members improved access to the intranet, including the ability to easily and securely access the new extranet from anywhere. Imaginet also facilitated the development of governance solutions to ensure effective ownership and management of content. With both the new extranet and intranet solutions, content ownership is now distributed so that people in different areas of the organization are responsible for their own content and can manage it directly. Imaginet played a key role helping CUCM transform digitally by significantly expanding its reach. CUCM’s extranet now provides the ability to engage a user base of almost 2,000 people including credit union management, frontline staff and credit union board members. The intranet solution plays a key role in terms of renewed employee engagement, knowledge sharing and collaboration, and aligns with the defined strategic goals of the association. CUCM launched its extranet to member credit unions with the tagline: “All You Need to Know”, referring to its role in meeting strategic goals for engagement and knowledge transfer.